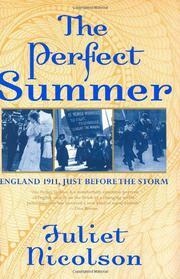 Appropriately written during a heat wave that devastated parts of Europe in 2003, Nicolson’s debut portrays a very significant season in English history. Residents of England, of course, were oblivious to the fact that the world was teetering on the brink of World War I, but they realized quite early on that the summer of 1911 was going to be exceedingly hot. Transporting readers back to those balmy days, the author provides a neat summary of the year’s key events before her main narrative begins as the temperature starts to rise on the first day of May. Much of the text’s absorbing charm comes from Nicolson’s welcome attention to marvelous details about the risqué fashions of the day, the emergence of new dances like the chicken-trot and aristocrats’ disdain for the term “weekends,” which they considered common. She couples these delicious minutiae with long passages depicting early-20th-century English life as experienced by people ranging in importance from Queen Mary to a lowly choirboy. Nicolson’s most impressive feat is to portray the abyss that sharply divided rich from poor. She carefully marks out the deaths that occurred among the underprivileged in their squalid, furnace-like dwellings. She notes the heat’s devastating effect on farmers, who saw barely a blade of green grass all summer. She also chronicles the strikes that ran rampant: “The vast labour force of industrial England was flexing its muscles.” The stark contrast between lifestyles is neatly underscored by anecdotes about an overprivileged idiot who hired an underling to wash and dry loose change, and about the disgusted reaction of diamond-covered dowagers to Nijinsky’s dancing in the Ballet Russes’ first London performances. However, amid the upheaval created by classes increasingly at odds with one another, Nicolson does find one area of common ground: the beach, which was enjoyed by both rich and poor in this most intriguing of times.